Winter is ever so slowly making an appearance here in Brisbane. The mornings are dark, there’s that slight chill you get when you step onto the tiles first thing in the morning, and my summer dresses are slowly being layered with cardigans, and somedays tights are even needed to keep my pins warm. It’s slowly making an appearance in the kitchen too. It’s the season where I love to make pastry because I and the pastry don’t melt in the process of rolling it out, and, of course, it’s the season of comfort foods. I’ve been a little slow to adopt a winter menu. 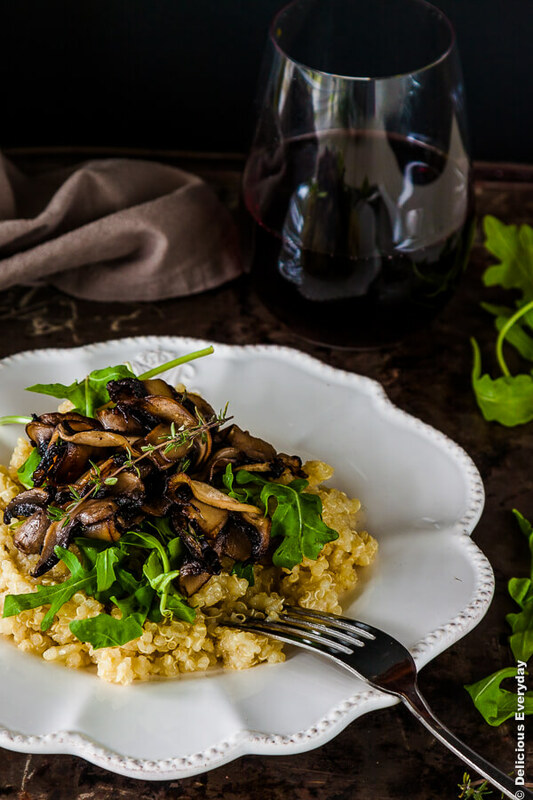 I’m still hooked on salads, and they are the most frequent guests on my lunch time menu, but yesterday, after a trip to the supermarket and coming home with a large bag of mushrooms I suddenly had a craving for a big bowl of quinoa risotto. Risotto, for me at least, is like a hug in a bowl. 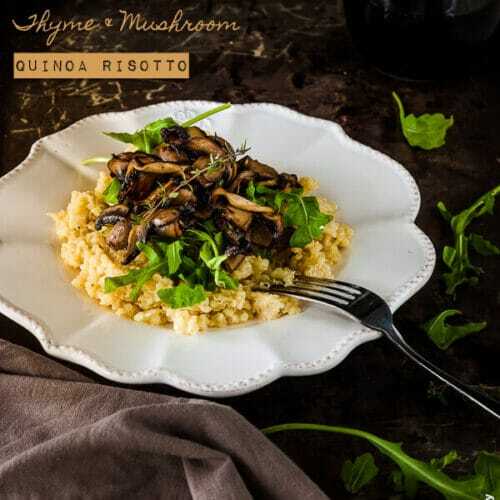 It is warming and soothing in a rib-sticking sort of way, and I find that quinoa risottos, such as this Thyme and Mushroom Quinoa Risotto (I’ve also shared a recipe for a Roasted Cherry Tomato Quinoa Risotto here) give me those warm feelings without that horrible heavy feeling you usually get after eating a rice-based risotto. The base for this quinoa risotto is simple, however in place of the usual parmesan you would find in most risottos I’ve used nutritional yeast flakes (sometimes called savoury yeast flakes) as I’d read that they are a great cheese substitute if you can’t eat cheese, which I don’t seem to be able to do any more. The yeast flakes do add a certain cheesiness to the risotto however I find it adds a touch of mealiness too. I’m not sure if this is just the brand I’m using, though (which is Lotus). But, if you can have cheese, go with the parmesan! The risotto is then topped with a good helping of mushrooms that have been quickly fried in a hot pan with a sprinkling of thyme. I also added some rocket (otherwise known as arugula to my American readers) as I like a good dose of greenery in my risottos. Place a large saucepan over a medium heat and add the olive oil and add the onion and cook until translucent, about 5 minutes. Add the garlic and cook until fragrant. Add the quinoa and coat in the oil, onion and garlic mixture and cook for a couple of minutes or until the quinoa starts to turn translucent. Add the wine (if using) and cook until it's absorbed. Add the stock, a ladle at a time, and cook until absorbed before adding another ladleful, stirring as you go. Once the quinoa is tender remove the saucepan from the heat. Taste and adjust the seasoning as necessary. Keep warm while you fry the mushrooms. I love that you used quinoa instead of arborio rice! Healthy choice! It’s nice to see tips especially on alternatives, such as nutritional yeast in place of cheese. This comes in handy when you have guests that can’t take cheese. 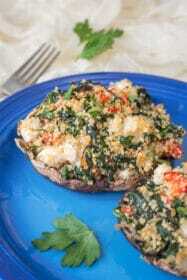 Thanks for sharing this healthy recipe! This looks so so yummo! I am loving quinoa at the moment and just starting to expand my repertoire. Risotto sounds great! 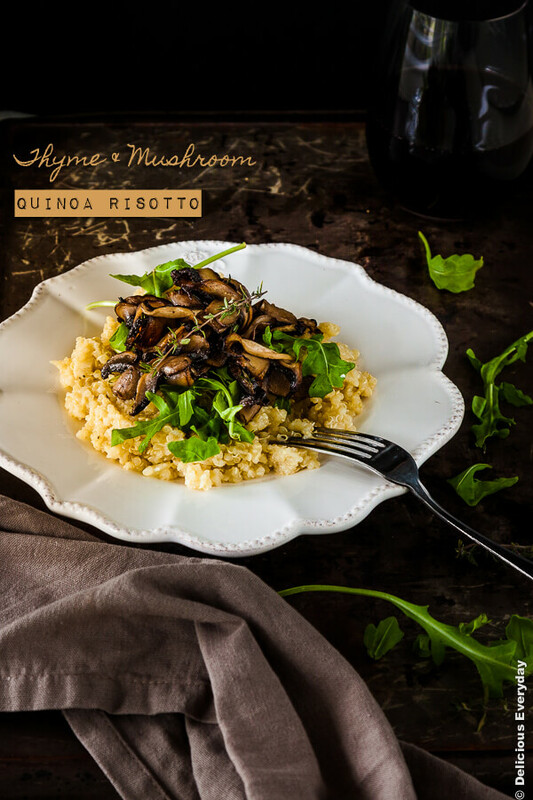 Risotto is one of my favorite comfort foods too, and thyme with mushrooms is always so good!